Danny was in the emergency room being treated for severe stomach pain. He needed an IV placed, but was very scared of needles. To help calm him, the Child Life Specialist demonstrated on an enCourage Kids bear exactly what the nurse was going to do to him. When it was time to place the IV, Danny hugged his bear tightly with his free arm and remained completely still. When the nurse was done, Danny smiled and proudly told his mom, "I was so brave, I didn't move at all, just like the bear!" Every donation of $25 provides a hospitalized child with a much needed friend. Children see a friend in the enCourage Kids bear's smiling face. Child life specialists, nurses, and doctors use the bear for 'medical play' — to help young patients like Danny know what to expect during a hospital visit. 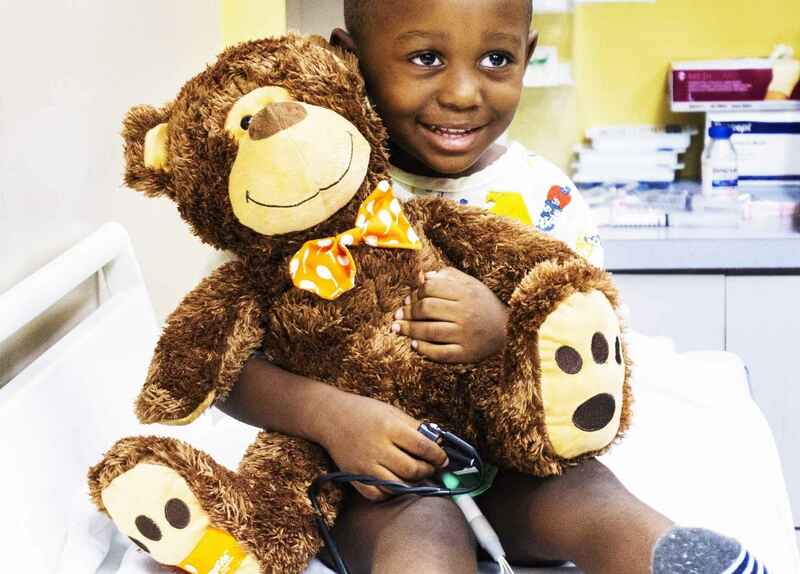 More than 30,000 cuddly teddy bears have made their way into the arms of hospitalized children since the Send a Smile, Send a Bear program began in 2009. Comfort, smiles, and courage — all delivered by one cuddly teddy bear. Send a bear today to help a sick child through her hospital stay. Each bear is individually wrapped, meeting hospital protocols for health standards. enCourage Kids Foundation is dedicated to making hospital stays a little less frightening for sick children, and creating family outings that make everyday life a little more fun. We are a proud BBB Accredited Charity Seal Holder and meet all 20 of the BBB Standards for Charity Accountability. Twelve Bears of Christmas! In appreciation of Kane Builders! My daughter received a bear when she was hospitalized after surgery. Happy to support this wonderful program. This is such a wonderful thing -- thrilled to be a part of this! Happy to support such a wonderful program. I am an eighth grader from Sacred Heart Greenwich trying to put a smile on these kids faces one bear at a time. For my wife and daughter who make my life "bearable" everyday. Happy to send a bear and support such a wonderful program for hospitals in my community.